We have come to understand the human-environment dynamics of a small Tasmanian catchment. Our focus throughout the extended period we spent in the field (and sitting in front of computer screens) was to explore the relationships between the use of water by farmers and the needs of oyster growers. The relationship between upstream catchment activities and the quality and quantity of water downstream (in estuaries and off-shore lagoons) is the fundamental issue in catchment management. 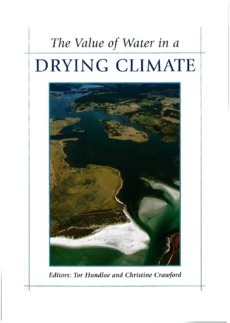 It necessitates an analysis of the value of water in different, and often competing, uses. On the face of it, that might seem a simple exercise. We show that it is complex, particularly once the researcher widens his/her horizons and looks to the people and industries who are not part of the catchment community but who rely on the catchment for their livelihood.